Happy Thanksgiving to my fellow Americans! In case I don't tell you all enough, I'm so grateful that you're here. It's Thursday, which means it's time for Craving Ellie in My Belly! As a special Thanksgiving treat, Sara gifted us with free rein to pick any Ellie Krieger recipe we wanted this week. Since I'm traveling to my home-away-from-home for a dose of holiday sunshine, palm trees, mountains, and family, I prepared my pick far ahead of time. That's my excuse for why it's not too Thanksgiving-y, despite the many fall-inspired recipes in Ellie's books. I was so excited to finally have a chance to make this dish; I've been wanting to make it since I bought the book, but our group already chose it (before I joined), so I hadn't gotten the chance. Ellie calls this dish Fried Rice with Edamame, Scallions, and Tofu, but I'm a veggie egalitarian and didn't think it was fair to leave out the equally important corn and peppers in the name. So I'm calling it plain old Veggie Fried Rice. As I usually do with Ellie's recipes, I made a few changes: fried the tofu first (Ellie would not approve) and used white rice instead of brown (again, not the most Ellie-ish choice). This one was a huge hit. I've written many times about how rice is one of my all-time favorite foods, and I'm always looking for ways to sneak it into main courses. One of the best things about this recipe: I adore fried rice but don't love cooked peas or carrots, which are pretty unavoidable in most fried rice dishes. The addition of edamame and corn was a perfect textural substitute for the peas and carrots, and added great flavor as well. 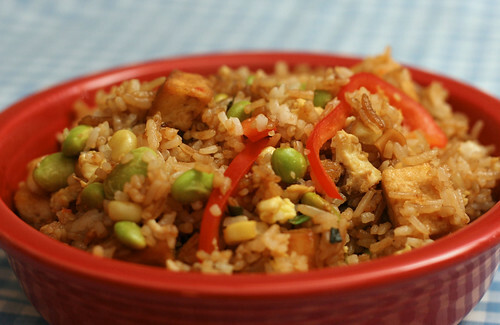 Make sure to use cold, leftover refrigerated rice straight out of the fridge and into the wok to avoid a mushy mess. 1. Heat 1 tablespoon of the oil in a wok or large skillet over high heat until very hot but not smoking. Add the garlic, scallions, and ginger and cook, stirring, until softened and aromatic (but being careful not to burn), 1-2 minutes. 2. Add the rice, red pepper, edamame, corn, and tofu and cook, stirring, until heated through, about 5 minutes. 3. Make a 3-inch well in the center of the rice mixture. Add the remaining 1 teaspoon of oil, then add the eggs and cook until nearly fully scrambled. Stir the eggs into the rice mixture, then add the soy sauce and incorporate thoroughly. Serve hot. Fried rice is a favorite in my house. I love the veggies! This sounds fantastic! I love rice, and veggies are always good =D. Enjoy your Thanksgiving Amy! I almost considered doing the chicken chop suey I missed a while back because we inevitably always end up eating some sort of Chinese food for dinner after Thanksgiving lunch! It's like we can't face the leftovers again that quickly :) I'm glad this one turned out well; it looks yummy! I always hve left over rice and enjoy 'fried' rice. This is different from most of the ones I have made. Looks really good.